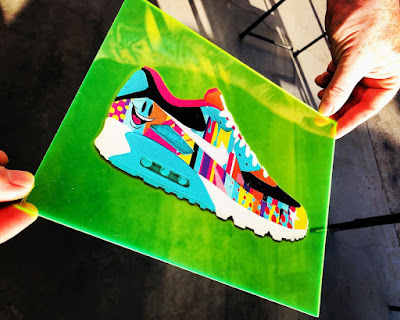 This Thursday, October 11th, Sket One will be releasing this limited edition “What The Sket” Air Max 90 Sneaker Print at the Sneaker Lab presented by Nick Kicks. This fantastic 8”x10” showcases Sket’s signature art style on a glowing acrylic base. Each piece comes signed and numbered, and will only be available at the Sneaker Lab event from 7-10pm at 721 S. Los Angeles St. You can find out more about the event here. If you’re in the LA area this is one art show not to be missed!